A small group of architects and developers interested in renovating the futuristic New York State Pavilion in Queens toured the complex yesterday with officials from the city Parks Department. Among those ready to suggest a use is Frank Campione, principal of CREATE Architecture Planning & Design. Campione contacted the city in 2001 seeking to stabilize the pavilion and convert it to an aerospace museum. 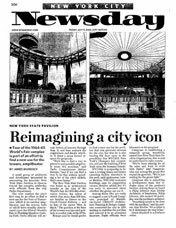 [Since then] Campione is establishing a nonprofit group named Save New York State Pavilion Organization that would be authorized to raise money. "We've been playing by all the rules and want to work with Parks," said Campione, who was among the group that toured the grounds. "We're just waiting for the green light." Campione also is assembling a development team that includes many of the pavilion's builders. Among those on board is Philip Johnson Alan Ritchie architects of Manhattan. Philip Johnson who turned 98 yesterday was the pavilion's [original] architect. Something needs to be done with the pavilion," said his partner Alan Ritchie. "It's a crime to let it deteriorate the way it has."